WASHINGTON (CNN) -- The U.S. Supreme Court sided Monday with white firefighters in a workplace discrimination lawsuit, a divisive case over the role race should play in job advancement. 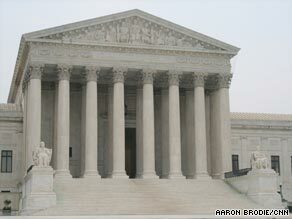 The Supreme Court in a 5-4 ruling backs firefighters in a reverse discirmination case. In the split 5-4 vote, a majority of the justices ruled that the city of New Haven, Connecticut, improperly threw out the results of promotional exams that officials said left too few minorities qualified. One Latino and no African-American firefighters qualified for promotion based on the exam; the city subsequently decided not to certify the results and issued no promotions. High court nominee Judge Sonia Sotomayor heard the case on her federal appeals court last year and sided with the city. The Supreme Court was being asked to decide whether there was a continued need for special treatment for minorities, or whether enough progress has been made to make existing laws obsolete, especially in a political atmosphere in which an African-American occupies the White House. "The city rejected the test results solely because the higher scoring candidates were white," wrote Justice Anthony Kennedy for the majority. "Fear of litigation alone cannot justify an employer's reliance on race to the detriment of individuals who passed the examinations and qualified for promotions." In a dissent read from the bench, Justice Ruth Bader Ginsburg questioned the fairness of the test, which was 60 percent written and 40 percent oral. "Relying so heavily on pencil-and-paper exams to select firefighters is a dubious practice," Ginsburg said, calling the majority ruling "troubling." "Congress endeavored to promote equal opportunity in fact, and not simply in form. The damage today's decision does to that objective is untold," she said. When the results came back, city attorneys expressed concern about the results, and the New Haven corporation counsel -- after several public hearings -- refused to certify the test, and no promotions were given. The city said that under a federal civil rights law known as Title VII, employers must ban actions such as promotion tests that would have a "disparate impact" on a protected class, such as a specified race or gender. The Obama administration took a nuanced position on the appeal. A Justice Department lawyer told the high court that while the federal government supported the city's discretion to nullify the test results, it also believed the lawsuit should be allowed to proceed on a limited basis. Kennedy argued that "the process was open [and] fair" and that the city officials "were careful to ensure broad racial participation in the design of the test itself and its administration." He added that "race-based action like the city's in this case is impermissible under Title VII unless the employer can demonstrate a strong basis in evidence that, had it not taken the action, it would have been liable" under the law dealing with "disparate impact." Kennedy said the city had not met that threshold. The case has received added attention because Sotomayor was on the appellate court that dismissed the appeal. Sotomayor was part of a three-judge panel that ruled in February 2008 to uphold a lower court decision supporting New Haven's move to throw out the results. In June 2008, Sotomayor was part of a 7-6 majority that denied a rehearing of the case by the full court. Legal analysts said they expect Republicans on the Senate Judiciary Committee will want to ask about her role in that case as well as her comments about ethnicity and the bench. • The court said it will reargue a campaign finance reform case dealing with a scathing documentary about former presidential candidate Hillary Clinton. The justices put off an expected ruling and will rehear the issues on September 9. The court usually begins its fall term in early October. At issue was whether the 90-minute "Hillary: The Movie" -- as well as television ads to promote the film -- should have been subject to strict campaign finance laws on political advocacy or was instead a constitutionally protected form of commercial speech. • The justices accepted the appeal of Timothy Abbott, who is fighting to gain custody and the return of his son, after the boy's mother secretly took him from South America to Texas. At issue is whether one country's court order preventing a child from being taken overseas by a parent represents "rights of custody" enforceable in another country. • A small Kansas church that has gained nationwide attention for protesting loudly at funerals of U.S. service members killed in overseas conflicts received a temporary victory. The justices rejected an appeal from Missouri officials over their efforts to keep members of the Topeka-based Westboro Baptist Church from demonstrating at least 300 feet from memorial services and burials. • Family members of those who died in the September 11, 2001, attacks will not receive a hearing before the high court on whether they can sue Saudi Arabian officials who allegedly helped fund extremist groups responsible for the attacks. • The court backed away from a case dealing with whether pharmaceutical companies can use patients' prescription drug histories to help target direct-marketing campaigns. Without comment, the justices turned down an appeal dealing with a state law restricting the commercial use of such information, meaning the New Hampshire law remains in place. • Retiring Justice David Souter said goodbye to his Supreme Court colleagues in a brief statement he read from the bench, saying they had "touched me more than I can say." The 69-year-old justice said he is looking forward to his retirement in New Hampshire but said he would retain fond memories of "the finest moments in my life."